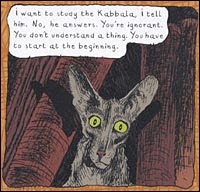 “The Rabbi’s Cat” by Joann Sfar is quite different than anything I have ever read. It’s the story of a talking cat who travels the world with his Jewish master. He travels to France and lives in Algeria. He can’t talk to everybody, but he can talk to a few. For some reason this atheistic cat wants a BarMitzvah. He is constantly aggravating the Head Rabbi. The cat's master has a daughter named Zalabya. Another important character is Cousin Malka. He’s a big man with a white beard and a pet lion. Malka has jobs as a storyteller, a hunter and a swindler. He uses his lion to scare people, then he pretends to save the day. Malka is my personal favorite character. Here is a chapter that I personally enjoyed a lot. Zalabya's husband had ordered a crate full of books. When the box arrives, it is filled to the brim with books, and a dead Russian! Every rabbi and minister in town is at their household. The Head Rabbi tries to write on the Russian with the "pen of life". He wakes up with a yelp and socks the Head Rabbi on the jaw. He only speaks Russian so no one understands him except for the cat. The cat's master and his son in law have to find a translator. They hear a saint is sharing his home with a Russian.The Russian tells them that the man who was in the box is a painter. They also learn that a large group of Jews live further south of Algeria. They are all hungry for adventure. They make a flag with Russia and Jerusalem combined into one. Along the way they meet a girl who tells them she has no name and also, I quote, TinTin. They only spend a few pages with TinTin. Soon the painter and the girl fall in love. How precious. In the end, the group just becomes dissatisfied with what they find and go home. The artwork in The Rabbi’s Cat is very beautiful. The cat is sometimes detailed and sometimes simple. The cat's ears are the most expressive part of his body. All of the words are hand written. The style is very French. I would give the art in The Rabbi’s Cat 5 talking cats out of 5. There is also a movie of The Rabbi's cat. I really like this movie just as much as the book. This is one case where a movie based on a book is completely faithful to the original storyline. It has 93% on rotten tomatoes. I think if your child is young, I would wait until they are older to read The Rabbi’s Cat. There are some bloody scenes. My recommended age is10 and up. Another great review! Makes me want to read this book again. You say it's "very French," and I agree, which has gotten me thinking "what does it mean for something to be French?" as opposed to American. I'll have to read the book to figure that one out. Cool review, Milo! Sounds like an interesting book! This is a most excellent review of a very good book. Your reviews are always entertaining and I can't wait for the next one! What a thoughtful review. It definitely makes me want to read the book and see the movie! Thanks for the review. Very enjoyable. I will be adquiring the Rabbi's Cat to add to our bookshelf. Great review! I think you're spot-on about the artwork, too. I like the way the drawings of the cat shift from simple to detailed, and really appreciated those expressive ears. Did you know that there's a sequel to this book? The Rabbi's Cat 2, it's called. I haven't read it yet myself, but would love to hear your take on it! Great review, Milo! I bought the book on your mom's recommendation a few years ago and loved it. Still, I had forgotten so much of the plot. Thank you for the recap. Based on your review, the book will now go to the top of my re-read list -- that is after Ben and Sarah have their turn. "Soon the painter and the girl fall in love. How precious." Your snarky asides always make me LOL. Great review. I love reading reviews about interesting stories. I look forward to reading this one. Thanks! My son is 12 years old too and I can't wait to show him your blog. He loves comics and graphic novels, so this is SO awesome for him to learn about more great graphic novels out there. Thanks so much for taking the time and sharing your opinions. You can add another fan to your fantastic blog! I was telling your mom on one of our new york homeschool yahoo groups how impressed I was with your blog & I decided today to actually read some of your reviews. I'm not really into graphic novels, but the title of this book caught my eye, "The Rabbi's Cat." You really make me want to read the book so I will let you know how I like it! Thanks for providing your many fans with this blog!